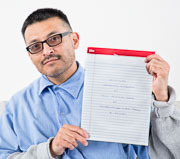 Poetry Class at Salinas Valley State Prison - 2017 Feb. The instructor is Tim Fitzmaurice. He is sponsored by the William James Association, as part of California's Arts in Corrections program.